Malcolm Cochran’s show Requiem, was on display at The Weston Art Gallery from February 9th, 2018 until April 8th 2018. According to Cochran’s website, The Columbus based sculpture, installation and public works artist has been making work since the 1970’s. His works are often large scale and interactive. Cochran’s show at the Weston continues with this theme. There are three pieces included in the show, each an invitation for the viewer to interact with or imagine themselves within the work. Cochran’s title piece “Requiem” is his first performance piece. Though Cochran is a seasoned artist, his performance piece did have shortcomings, the intention of Requiem was somewhat absent from the work itself, and a disconnect was present between the subject matter and the piece. The first piece the viewer encounters when entering the street-level gallery at the Weston, is a larger than life, 16x larger, side view mirror from a 1957 Chevrolet. The huge form titled “History Lessons”, engulfs viewers in a circular tilted mirror. The reflective steel surface is so large that when standing directly in front of it, only the base of the form and wood beam supports can be seen. Thus, the viewer is confronted by their own reflection. The base’s aerodynamic and sleek design harkens back to the 1950’s, and places the form in a specific time. From the provided gallery text, the form is a metaphor for “this country’s relentless optimism and scant historical memory”, asking the viewer to consider the function of the mirror in relation to form, as a device that would reflect the past while literally being driven forwards. In doing so, the artist references a turbulent and restless time in America’s history; one in which the hope and optimism of the Civil Rights movement was constantly fought against by social history and memory of America, one which refused to forget its prejudiced history. In the current political and social climate, the mirror almost seems to challenge the viewer, asking one to consider their own place in history. Malcolm Cochran, History Lessons (2011). Poplar, steel, stainless steel mirror, whitewash. Photo courtesy of Lauren Darpel. “Washing Feet” is a multimedia installation in the downstairs gallery space, adjacent to “Requiem”, and the title speaks for the piece: a video of the artist washing people’s feet is projected onto a marble block and foam stand. The marble block is situated on the ground were the video of feet being washed is projected, and a metal rod supports a foam core screen onto which the head of the body is projected. The absence of body creates interest in the work, and focuses the viewer on the relationship between the washer and washed. These older pieces in the show are typical of the artist, in that they invite the viewer to participate or imagine themselves in the work, to be engulfed in a reflection, or to imagine someone washing their feet. In the title piece however, Cochran fails to unify or sufficiently address the subject of the piece, revealing a disconnect between subject and execution of the piece. “Requiem” is an immersive installation in the front room downstairs gallery space and, From Gallery text, the piece was informed by the burial coffins of the genocide victims of the Srebrenica massacre of 1995. According to the Encyclopedia Britannica, Bosnian Serb forces were responsible for the death of thousands of Muslim men and boys, and the massacre is considered “the worst episode of mass murder within Europe since World War II,”. The walls, ceiling and floor are all covered in white paneling or vinyl, and wooden benches wrap around the room. Stark fluorescent lighting illuminates the 16 modified vintage refrigerators Cochran installed in rows throughout the room. Like “History Lessons,” the fridges are characteristic of the 1960s’ in their sleek finishing, simple design, and pastel colors. The fridges are gutted of mechanics, the insides upholstered in silk and fabric that mimics coffins, and given a porthole like window. Various fridge coffins are open to accommodate performers who during a one-time performance on March 18th at the gallery, sang from inside the fridge-coffins with only their heads visible through the portholes. Absent of any actual performers, the closed memorials play recordings of a cappella singing. The combination of the voices ringing out from closed coffins, the fluorescent lights and sterilized room, give the installation an ominous and unsettling feel, which was intended by Cochran. While his work is often interactive or viewer conscience, this performance was a first for the artist. While a similarity in form can be drawn to the burial coffins and refrigerators, (the coffins were a mint green color and solemnly simple design) the fridges are not transformed enough to transcend or re-contextualize the original object and its function—nor to adequately inform the viewer of the severity of the artist’s reference. 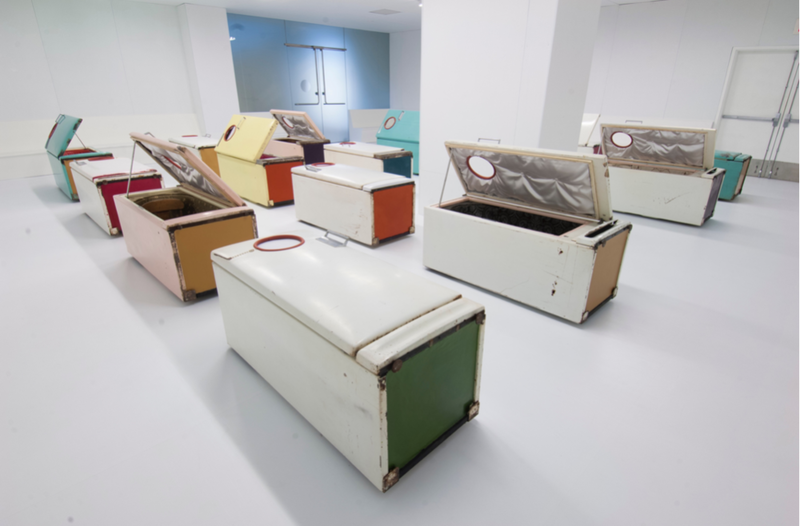 The fridges still register as adapted food storage units laid down in rows, and Cochran gives no explanation as to why fridges were used—suggesting that their visual similarity to coffins is the only reason. The white room itself feels unnecessary, and the combination of the sterile room and 1960’s style is vaguely reminiscent of space fantasy.According to gallery text, Cochran aspired to utilize “the mundane and the discarded” with singing as a memorial to victims of warfare and genocide. Instead, the marks and damage still present on some of the fridges and even the arbitrary upholstery, feels careless and unintentional when seeking to honor and memorialize victims of genocide. The disconnect also extends to the songs curated and written for the piece. According to the provided gallery materials, the songs are a conglomerate of traditional Polish, Armenian, German, Mongolian, and Japanese songs and commissioned compositions for the piece. The concert contains no songs regional to Bosnia Herzgova, and instead Komitas’ Orror is the only piece to directly reference genocide, as Komitas was a survivor of the Armenian Genocide. Perhaps the concert of voices would have benefited from Islamic songs to celebrate the traditions of those who were murdered in Srebrenica for their beliefs. Malcolm Cochran, Requiem (2018). Refrigerators (carpeting, upholstery, pigmented wax, interior lighting, rubber hose, audio speakers) fluorescent lighting, perimeter benches, solo, a capella vocalises, pre-recorded and preformed live on March 18th, 2018. Photo courtesy of Tony Walsh. The intention of Cochran in his installation piece is well meaning. Perhaps varied compositions and mass produced objects half heartedly transformed into coffins was meant to unify viewers in solidarity against the widespread tragedies of warfare, but the mark was missed in Cochran’s shallow consideration for appropriate portrayal and representation of the tragedy. In the gallery text, “Requiem" is described as “startling, destabilizing and moving.” In seeking to do so, Cochran frames the reference to the genocide of Srebrenica as a conceptual prop in creating an installation only for the shock value—thereby discrediting the solemnity of the work. The shortcoming of “Requiem” is a call for artists to make responsible and informed work that considers their audience as well as subjects with sensitivity and respect. Cochran’s exhibition Requiem was on view at the Weston Art Gallery on 650 Walnut Street, Cincinnati Ohio, from February 9th, 2018 through April 8th, 2018. More information and gallery times can be found on the Weston’s Website; https://www.cincinnatiarts.org/weston-art-gallery. Lauren Darpel is a second year student at the University of Cincinnati studying Fine Art and Art History. She is interested in sculpture and printmaking, and enjoys writing about art as a way to inform others and enhance her own practice as an artist.